. . . . He cherishes his theme, in which he as no other composer compressed what was to come, tension and the sharpest outline of tension. He goes on lovingly considering the theme from all angles and prospects until it blossoms forth and until, in the great modulations of the fugue, it has become an unlocked shrine, an internally unending melody (`internally' meaning within the context of the theme), a melismatic universe in respect of the developed individuality of his theme. For precisely this reason, Bach's layout is not purely diatonic, however clear its flagrant nature. Obviously the harmonic clement in itself becomes irrelevant with Bach insofar as it is manifested in a fortuitous, pleasantly meaningful simulultaneity of the parts. But it is surely not irrelevant to the extent that the pertinent motions and their framework, which is to say the counterpoint, are now also the paramount factor and, as such, emphasized. 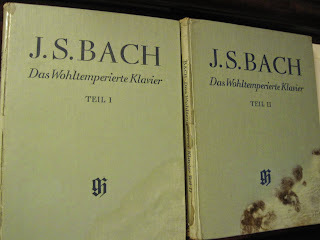 To the extent that it represents a complete horizontal transparence, it is certainly the essence of Bach more than it is of Beethoven and Wagner. And yet, even in Bach, there is in the layout an active desire. There is the pervasive flow of a succession of themes rich in associations, a twofold thematicism already inherently rich in tension which finds itself far less strongly dependent on the constant polyphony's non-decisive part-writing than on the transitional, turning and corner points, but above all the rhythmically stressed anchor-points in the harmony. And as we can see, this is not straightforwardly homophonic but a different, deliberately chosen harmony, one that underlines, that emphasizes by virtue of its mass. 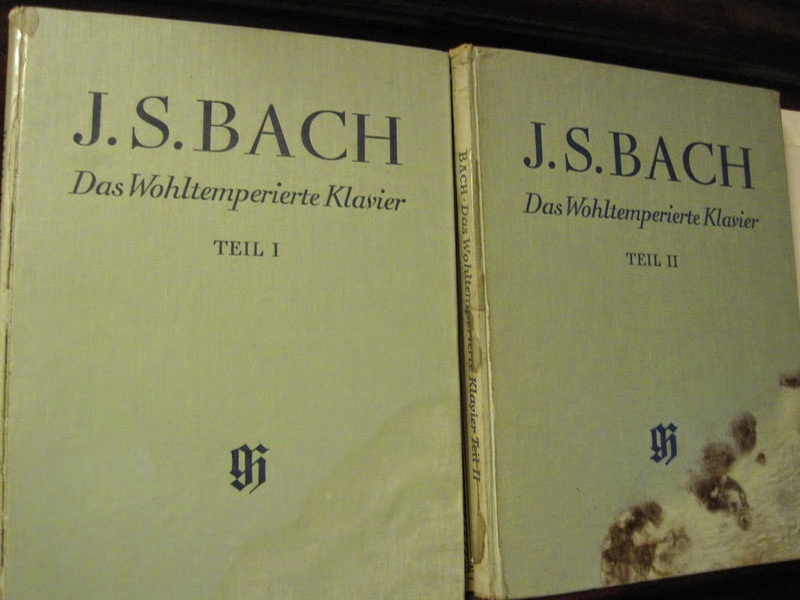 The one reflects upon the other, even though Bach remains the master of the single voice, multiplying the old homophony by two or by five, the intrinsic master in the spinning to of lines and in this procedure's seemingly unlyrical, supra-lyrical domain. The blending, harmonic-rhythmic element still has an influence: it prevents a revelling in the mechanics and the formal aspect of counterpoint even where Bach's wide gaps between parts play an important role in preventing a vertical blending, i.e. the being and changing of whole columns of notes or hosts of chords, no matter whether rhythmically diminished or caught up by and released from he dominant. But it is only the song, the theme, that seeks to become extensive and unending within th fugue melody which is, as it were, internally unending. It is by virtue of this above all that the element of diatonic counterpoint is reduced to a mere means, to something reflexive, permitted only because the lyrically flourishing melismata acquire a sharper profile from the juxtaposition. For it is in the contrapuntal or, rather, dailiness system of balances that they can best represent their protected, unbroken simultaneity, that lyricism of theirs which no longer has any individual relevance but simply means soul, developed soul. And that lyricism, in spite of all the dramatic community choruses, is the core of Bach's Church music. Where this balance is self-supporting, it is easy to recognize, within the framework of Bachian counterpoint, the hidden, connected, multi-layered lyricism of he Passions, built into the niches of three-dimensional counterpointing. It is akin to the uneven surface of the bas-relief, where we can feel the presence of air, the arrangement of figures in the landscape and, in fact, the whole actual landscape that is set in the rise and fall of the uneven background. 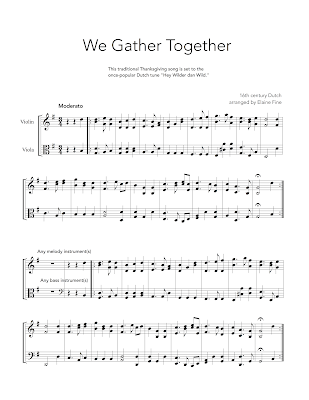 Here's one more Thanksgiving arrangement that can be played with violin and viola or any combination of treble and bass instruments. You can download a PDF to print here. I wish a wonderful day of Thanksgiving to everyone who visits here! 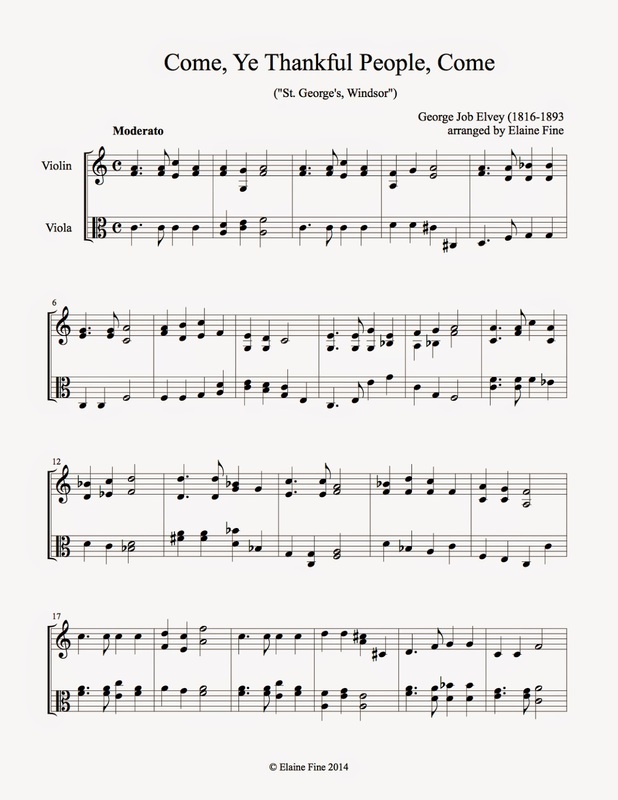 Most people know this traditional Thanksgiving Hymn as "Come, Ye Thankful People, Come," but the piece was originally called "St. George's, Windsor," and was written by Sir George Job Elvey (1816-1893) who was the organist there. 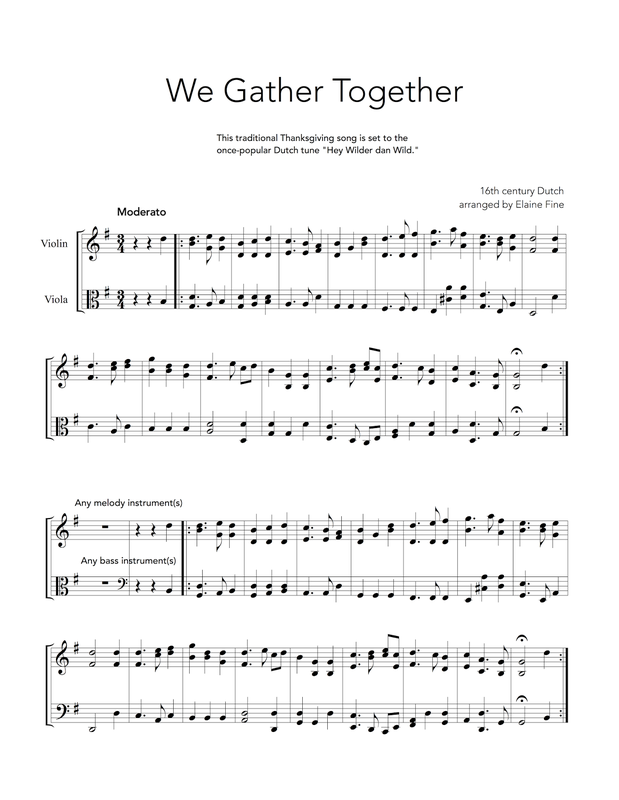 It works very well as a duet for violin and viola. George J. Elvey (PHH 48) composed ST. GEORGE'S WINDSOR as a setting for James Montgomery's text "Hark! The Song of Jubilee," with which it was published in Edward H. Thorne's Selection of Psalm and Hymn Tunes (1858). The tune has been associated with Alford's text since publication of the hymn in the 1861 edition of Hymns Ancient and Modern. ST. GEORGE'S WINDSOR is named after the chapel in Windsor, England, where Elvey was organist for forty-seven years. 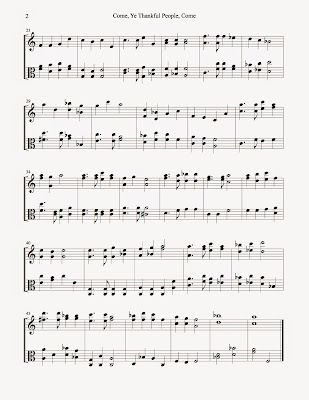 This serviceable Victorian tune is held together by the rhythmic motive of the opening phrase. Sing the opening stanzas in parts, but sing the prayer of stanza 4 in unison. Use of the descant by C. S. Lang (PHH 253) with stanza 4 may suggest a foretaste of heaven's glory. 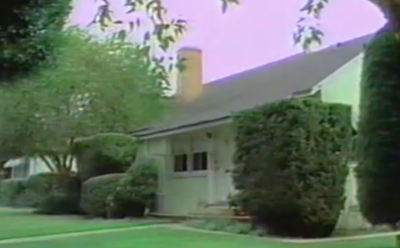 People who have come here from Michael's blog will certainly get the reference in the title, but for those who have found their way to this post by other means, you can get some context here. But don't forget to come back for the recipe! Find two mixing bowls, a set of measuring cups, and a set of measuring spoons. Cream 1/2 stick of softened unsalted butter with 3/4 cup brown sugar. Add 2 eggs and 1 tablespoon of vanilla extract. In another bowl mix 1 1/4 cups whole wheat flour with 1 teaspoon cinnamon, 1 teaspoon baking soda, and 1/2 teaspoon sea salt. Mix the dry ingredients together and add them to the creamed mixture above. Once everything is incorporated, add 3 cups old fashioned rolled oats (not the quick-cooking kind) and 1 cup of raisins. The real secret to cookie baking is using the right pan. The right pan is made by USA Pans. Mine is called a "Half Sheet Pan," but it is pretty much the same as the jelly roll pan in the link above. You flip it upside down and use the bottom as a cookie sheet. I also just noticed that they now have an actual dedicated cookie sheet in their inventory, which I bet is just as good as their half sheet pan. Make tablespoon-sized balls and flatten them out onto the un-greased cookie sheet. I aim for getting 20 onto one cookie sheet, which is about half the batch, and then I put the remaining dough in a covered container, which I pop into the refrigerator to bake in a couple of days. Or the next day. Bake the cookies for 12 minutes. Take them out of the oven, but leave them on the cookie sheet for a minute or two. Then transfer the cookies to a cooling rack. They will be crispy in about five minutes. Let the cookies cool completely before storing them in a covered container. Research shows that self-discipline is a better predictor of success in life than IQ tests – and it has further shown that good character and resilience can be taught at schools, with lifelong benefits. Work at the University of Birmingham Jubilee Centre for Character and Values shows that an undue emphasis on exam passes robs young people of the broad education that schools should be providing. As much as I appreciate school music programs, I really believe that it is the teachers and not the programs that make all the difference. Like general education programs in colleges, musical education programs often attract students who are adequate at applying methods to what they teach once the find themselves in school positions, but some are not necessarily good teachers. I have seen too many music teachers make school musical activities uninteresting and even annoying. I have also seen teachers who are excellent musicians themselves turn neglected abused music programs around. Studying music, particularly the classical kind, is not a way out of economic poverty. Someone who practices like crazy in high school and sets out to make a living in music these days has a good shot at life at or below the poverty level unless s/he acquires the skills necessary to get a day job to support a musical habit. On the other hand someone who has private lessons from a good (and affordable) teacher can bring the values of musical experience into adult life while following a non-professional or semi-professional musical path. Like everything else in the business of education, what matters most is the ability of the individual teacher to reach the individual student. It can happen in a classroom or in a private studio. This is a slow and steady process that involves commitment on both sides. It is also something that cannot be quantified in any way, because success is different for every single student. Some students have a lot of intelligence, but they don't pay attention to what they need to do physically on the instrument in order to make a beautiful sound. Some students make lovely sounds, but have difficulty with rhythm. Some students have difficulty opening up emotionally through music. Some students don't have the patience to listen to themselves. Some students don't practice. Some students practice, but hold a lot of tension in their hands. Some students have good enough ears to get away with not reading music. Some students read music well, but have a difficult time thinking beyond the notes and rhythms. The journey is different for every musician at every stage of the game. There's much that I cannot control in the world, but I know that when I am practicing I have the ability to control the beginning (including the when and how) of every single note I play, as long as I pay attention and take the time and care to do so. 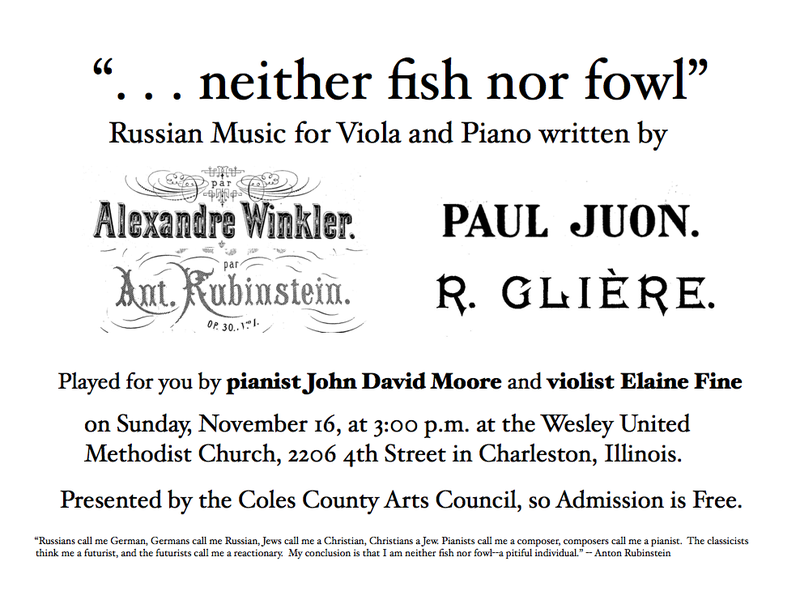 It's not just Anton Rubinstein (1829-1894) who is "neither fish nor fowl." Everyone here has influences from outside of Russia's borders. Even Reinhold Glière (1875-1956) who was born in Kiev, died in Moscow, and spent his entire career in Russia, became immersed with the folk music traditions from Azerbaijan and Uzbekistan. The four Preludes for piano (from Opus 30) are right at home (or perhaps would be better to say appropriately far from home) in this cosmopolitan program. Alexander Winkler (1865-1935) was born in Besançon, a city near the German border of France, studied law and piano at the University of Kharkiv, and taught at the St. Petersburg Conservatory. He wrote his Viola Sonata in 1902, and dedicated it to Auguste Joung. The final movement is a set of musically-cosmopolitan variations on a song in Breton, a Celtic language spoken in the lower part of Brittany, near the region where Winkler was born. Paul Juon (1872-1940) was born in Moscow to Swiss parents. 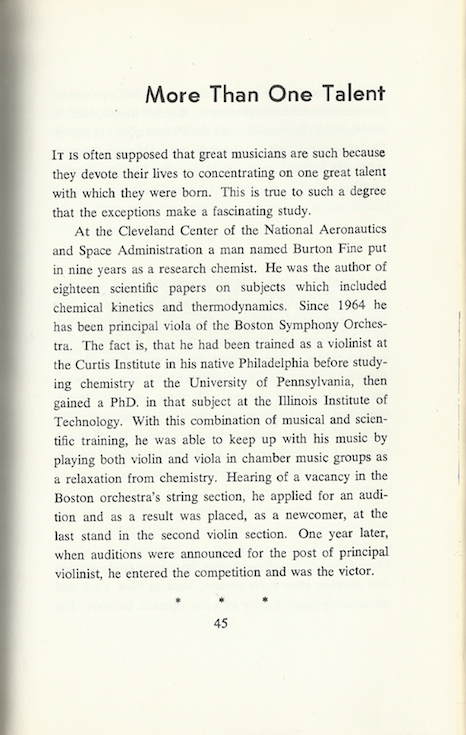 After studying with Arensky and Taneyev at the Moscow Conservatory, he left Russia to study in Berlin. He wrote his F minor Sonata, Opus 82 for clarinet and piano in 1923 and dedicated it to the clarinetist Ernst Orlich, who served as the University Rector at the Berlin Technical High School. He probably made the viola transcription for his own use. Most people who read this blog live far away from Charleston, Illinois, but anyone within driving distance (or walking distance) is welcome to come! 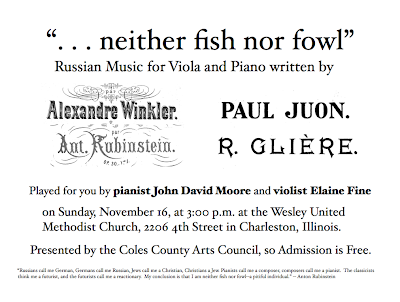 We plan to make a recording, so if you can't come would like to hear something from the concert, just let me know. Remember the Smothers Brothers and the "Supreme State of Yo?" This video below is set at the right place, just in case this state is new to you. I have experienced the trance-like state that sets in when I am in the Supreme State of Mow (while mowing the yard, something I actually enjoy, as long as I'm not mowing up hill). When I practice scales or Bach in the morning, I find myself immersed in the Supreme State of Bow. "I never trust rules that tell me never to do something." This came blurting out of my mouth during a rehearsal today, and I thought I'd share the sweet irony. I just came across a great book in PDF form by Toby Rush that explains the ways of means of musical notation, harmony, counterpoint, modes, and the forms used in the common practice period. 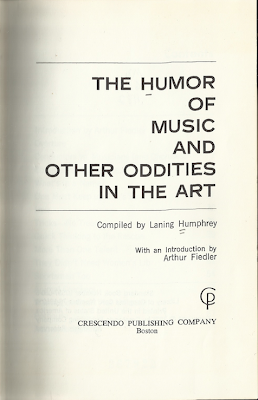 This book is witty, but it is also correct, complete, and straightforward. 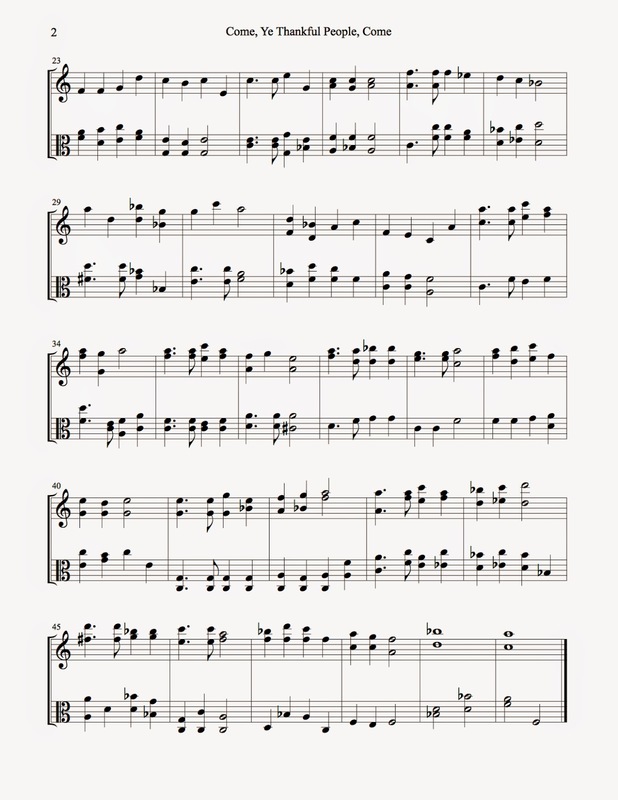 I'm planning to use these pages with my violin students, and I thought I would share them here. A while ago I made a post about WQXR's Q2 Podcast called Meet the Composer, and now that I have listened to a few episodes beyond the interview with Caroline Shaw, I'm starting to have issues. I could stew about these issues, or I could write about them. I choose to write. Nadia Sirota, the host of the show, is a far better violist than I am, and a far better radio host than I was during my time on the air (broadcasting 40 miles in all directions from a college station in a small town in downstate Illinois during the last century). I certainly appreciate what she is doing for the composers she works with in New York, and for new music in general, but I fear that the music she presents on this particular program (at least this year) sounds kind of the same to me. It seems that everything I have heard so far (with few exceptions) is minimalist in nature, and much of the string music seems to exploit the natural harmonic series. I listened to a great deal of new music when I was a teenager in the 1970s. My first opera was Wozzeck. The first piece I sang in a professional chorus was Stravinsky's Canticum Sacrum. I have a special fondness for the sound of 12-tone music because it reminds me of Tanglewood, where I spent summer after summer attending the Fromm Festival concerts. I wanted to be a composer during the 1970s, but I knew that writing in the 12-tone idiom was not any kind of true expression of who I happened to be. I had no interest in electronics, and never wanted to use rock music as the basis of the music I imagined writing (like my brother Marshall did). As much as I would like to have embraced it, I found minimalist music repetitive and boring. I wanted to write music that meant something to me, and I wanted to write music that would be as moving to me as the music that I loved from the whole of the history of notated music. I couldn't wait for minimalism to die out. By the time I turned 40 I had lots and lots of music to write, so I just started writing. When I was in my 20s I thought I knew a lot about music. A lot of people thought I knew a lot about music. 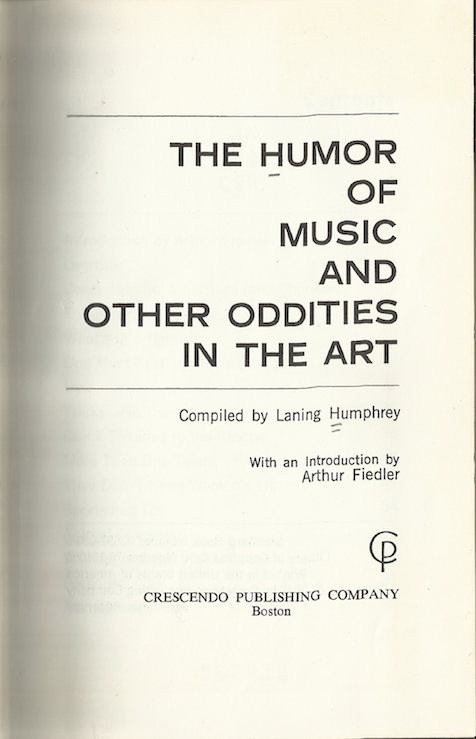 Through working at the radio station and reading scores and scores of books about music I learned more about music. I eventually learned that I knew very little, and that my narrow-minded views were ridiculous. Perhaps they still are. I don't believe I really started to learn about music until I reached my 40s and started writing music seriously. Now that I am 55 I feel like a kid in a candy store, because with the hopes of a career behind me, I have the leisure to keep learning new things about music. My experience of music is far deeper than it was when I was in my 20s and 30s, and my understanding of how important it is to get from one note to the next in a meaningful way sometimes yields real results. Sometimes I get, whether writing or playing, from one note to the next in a way that I feel is a true expression of how the music should go. I do hope that Nadia Sirota ventures out of the envelope she has drawn around her new radio program and finds composers of note (no pun intended) who write in ways that don't simply reflect her personal love of extended techniques, minimalism, the harmonic series, and their spectral sisters. There are a whole lot of people in her parents' generation (like me) and even in her grandparents' generation who are indeed interested in hearing interviews with living composers who write in other ways, even in traditional ways. When I hosted a radio program that ended at noon, this was my usual selection for the last quarter hour on October 31. A mother warns her son that if he does not behave she will summon the Noon Witch to take him away. He does not behave, and the witch arrives at the stroke of noon. The witch, described as a horrible creature, demands the child. The mother, terrified that the witch has actually come, grabs her son, and the witch begins chasing them. Finally the mother faints, grasping her child. Later that day, the father arrives home, and finds his wife passed out with the dead body of their son in her arms. The mother had accidentally smothered their child, while protecting him from the witch. The story ends with the family's lament over the terrible event. Here's the blog post that started the current ruckus, and a response from 2013 to O'Connor's earlier blog post. I should mention that there are many excellent alternatives to the Suzuki method, and there are excellent ones that are available for free in the IMSLP. I have always believed that it is the teacher and not the method that makes for a successful musical experience. 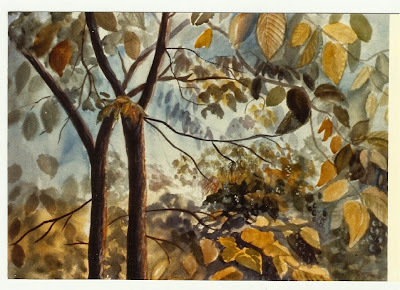 My mother, who painted the above watercolor, is very much alive, but she no longer paints because she can no longer see. 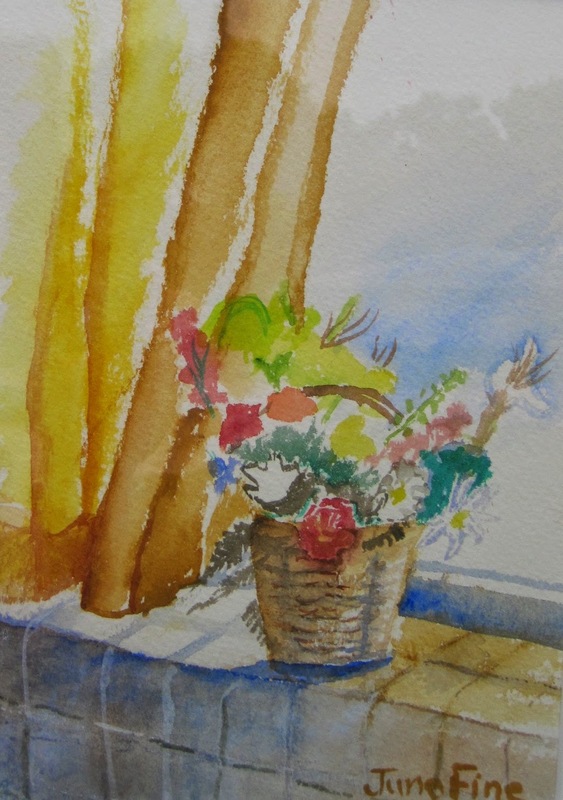 When I told her that I wanted to put her paintings on a blog so that her friends and acquaintances could see her work, she remarked that she wasn't able to get much money for the paintings she sold because she was a living artist. I wonder why is it that after someone dies their work becomes more valuable. It is because there is a finite end to their output? My mother's finite end to her work came when she could no longer see lines and colors, but I believe talking about her work with people enriches her life as well as the lives of people who are able to see it. Why is it that people so often wait until someone is no longer alive to voice appreciation for a body of work, be it musical, literary, or artistic? Much of our human culture seems to be obsessed with the idea of some kind of afterlife and/or some kind of immortality, but not being a person who believes in an afterlife or immortality, I know that will not derive any pleasure or benefit from having a posthumous career. Many people struggle to get their work known beyond a small circle of friends, but more often than not it isn't until an obituary hits the newspapers or the internet that people in the "outside world" pay attention. Writing music is only part of music making. A piece of music, no matter who wrote it (or Whom) only comes alive when people play it. A good composer tries to make an interpretation inevitable through the writing, but the composer's input really stops once the music is notated and distributed or published. A piece of music is a gift to musicians of future generations, but once the composer's life is over s/he will never know where it is played, or by whom. 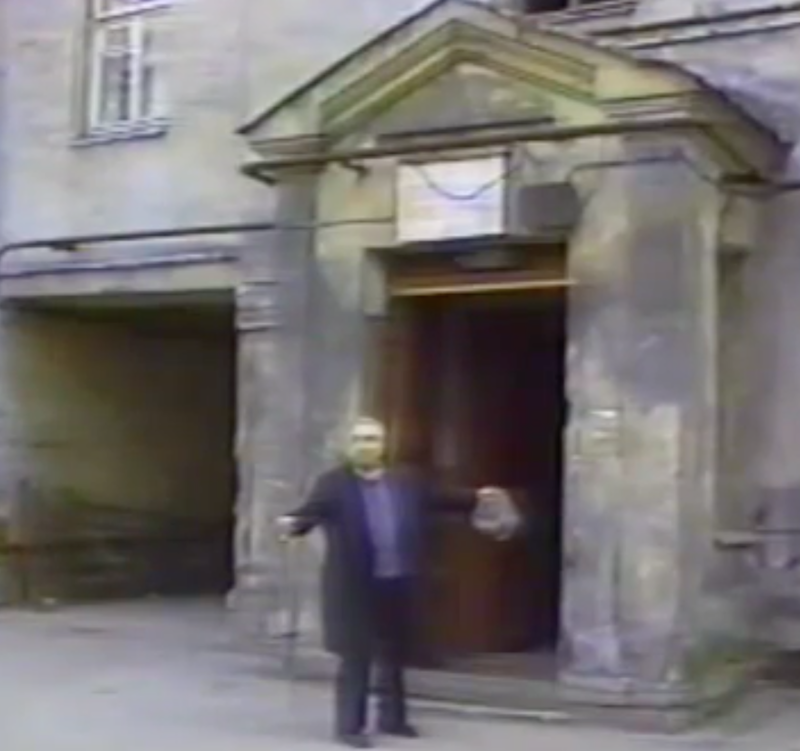 Recordings give an illusion that a person who is no longer alive is somehow present. The larger the musical personality, the more convincing the illusion will be. But it is still an illusion. Recordings give the illusion that someone who is alive but not within earshot is present. Writing is similar. I still find it miraculous that someone's "voice" can be transmitted into another person's head centuries upon centuries after the writer put pen to paper (or knife to tablet). A writer can also transmit his or her written voice instantly to just about anywhere in the world. A visual artist can capture an image (moving or still) of a time that can never be revisited, but it is just an illusion because no time can be revisited. We move on and unconsciously filter our memories so that we have room for new thoughts. We need visual art to remind us of where we have been, or not been. All we really have is the present, and we can use the powerful tools of communication we wear on our faces and carry in our pockets to communicate with people we care about in real time. I think that it is important to celebrate the work of the living. They (and we, as long as I am here) are trying to make the present matter. My violin students need to be constantly reminded to keep their left arms under the violin while they are playing. 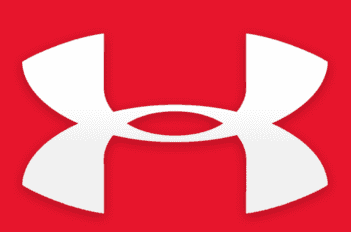 Today, while I was (once again) reminding a pre-teen student to keep her arm under, I noticed that all her clothes had the "Under Armour" logo on them. I drew it in her music to remind her to keep her arm under. Under Armour = Arm Under. We both laughed. I told her that I would share this idea with other violin teachers on line, so here it is. Remember that you read it here first! While I was slowly and carefully playing through the last of Bach's English Suites until a few minutes ago, I kept thinking about how many rules of counterpoint Bach breaks, and how often he breaks them. 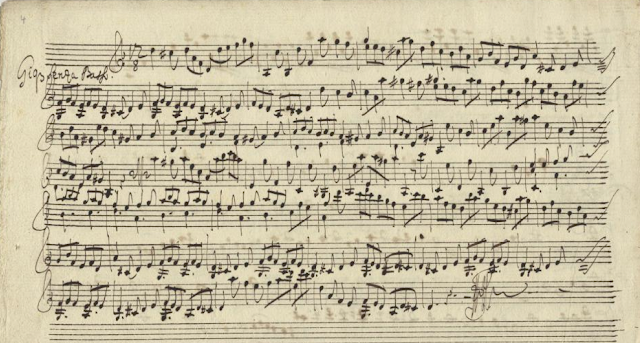 Then it occurred to me that Fux (1660-1741), the guy who wrote the rules of counterpoint as we know them, may have predated Bach by a generation, but he didn't write his Gradus Ad Parnassum until 1725, and by the time Bach could have even gotten his hands on a copy he could no longer see. I have nothing against Fux. I cut several sets of teeth on Gradus Ad Parnassum. I just had a sudden realization about Bach today, and appreciate his deviations from what is to be expected even more than I did yesterday. I used to enjoy teaching music appreciation classes at our local community college. In the early years of the 21st century I had students in my classes who were genuinely interested in the material. Some were adult students who had returned to college after having children, some were adult students who were trying to make a new start by getting an education after unproductive early adulthood, and some were students who had served in the military. I had extremely smart students of normal college age who were using community college as an inexpensive way of taking courses that could be transferred to a four-year university. I also had students who had very little in the way of reading and writing skills, because the college had an open admissions policy. Some of these students found that they were genuinely interested in music (some, of course, were not). I even had a composer one semester, and I had to keep him stimulated while trying to get novices to understand the rudiments of listening to form in music. During the past five years we have been suffering from some kind of a shift in our university community, and for various reasons college enrollment is down. I watched the abilities of my students slide downward, and found that very few students were able to get by with more than a passing grade during the last two semesters. Too many of them couldn't pass. Now most of the music appreciation classes have been cancelled, and mine, which met at 8:00 in the morning, was one of the first to go. For a while I really didn't know what I would do. Thanks to the kindness of one of my dear friends, and the departure from town by another friend who taught a handful of violinists, I now have eight new violin students who range in age from 9 to 14. It's been years since I worked with this many young people, and it is really refreshing to teach people who want to learn to play just for the sake of playing. Everyone seems to be making progress, and I am making progress as well, because I make a point of practicing what I teach. I listened to an interview with Caroline Shaw today on "Meet the Composer," the new podcast from WQXR's Q2 station. I was impressed with the way Nadia Sirota conducted the interview, impressed by Shaw, and impressed with her music and the way she explained the extended vocal techniques used by Roomful of Teeth, the vocal ensemble she sings with and writes for. I plan to listen to this podcast regularly. When I taught flute students I would often observe their throats getting tight when they found themselves in the musical land of many sharps. I noticed it in myself as well, and always had to work to counteract the tendency. Lately I have noticed the tendency of my bow arm to stray from the optimum sounding point when I find myself crossing strings in musical landscapes that have many flats. 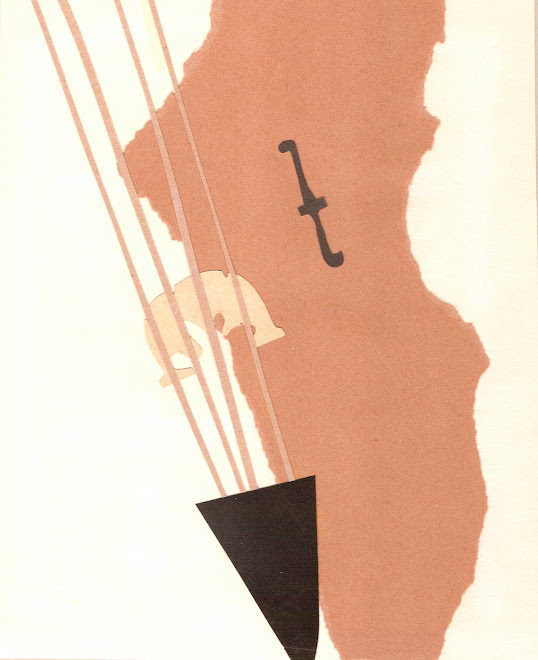 I have spent the past two days being blown away by the beauty of Adolf Busch's bow arm and his overall musicianship, but this film, a kind of animated graphic novel with Busch's Opus 40 String Sextet as its soundtrack, increases my admiration for this tremendous musician even more. The String Sextet was never published, and the manuscript is in the Brüder-Busch-Archiv in Karlsruhe. Perhaps an administrator for that archive might find a way to scan the score and parts and add it to this page of the IMSLP. On the bottom of my blogger screen is a little tab that reads "Complaints," so I'm using this moment to register some of my complaints about what seems to have turned into a life as a targeted consumer. I usually look at my email first thing in the morning. I used to engage in lengthy correspondence with friends from near and far, but now my email experience consists of deleting sale notices from stores where I happen to have shopped once and notices about musical events far removed from my realm of interest and my location. Sometimes I find a message from a friend, colleague, or family member, and once in a while I get a notice about a comment to this blog, but it is always the exception. There are sometimes work-related email messages, which I always welcome. I have actually come to cherish those. I delete between eight and ten messages before breakfast. By lunch time there are usually eight more. I always try to "clean house" in my inbox before I go to bed. If I look at Facebook these days, I am bombarded by "posts" from people who have paid to have their "posts" reach me, along with ads from places where I might have shopped on line. I bought some socks on line last week, and ads enticing me to buy more socks popped up everywhere (and not just on Facebook). Facebook seems to have become the de-facto vehicle for personal communication, and I hate the fact that I have had to use it as such in family matters. "It" is kind of making "itself" indispensable (and in some ways it is making me feel dispensable). I have decided, for the sake of my health, to limit my Facebook time to 17 minutes per day. Today's US mail brought two letters. One was an official looking one from Washington, DC marked "Finance Department." It was, of course, a plea for money from a political organization. The other had a hand-written address (which, upon further study, I realized was just a very well-designed handwriting font). Then there was a card from a business that sends us catalogs, and a New Yorker magazine. Somehow, around the time when the ads in my email inbox started increasing, the annoying robo telephone calls started decreasing. If the phone rings now (and it does rarely) it is usually from someone in the family, or an automated reminder from our HMO to get a flu shot (which just happened--while I was writing this very paragraph). I have to say that thanks to technology I have NEVER felt so emotionally disconnected from the outside world, which appears from this end to be an endless stream of people trying to sell me stuff. Thank goodness for music. End of rant. Time to practice and (thankfully) teach a few lessons later this afternoon. This is today's picture on my mother's art blog. She made it in 1992, and I imagine that the title "Getting Better" refers to her watercolor technique. But it also has a lot of personal meaning for me right now, and I imagine that it might have meaning for other people as well. Grief is a complicated process that seems to happen in dreams as well as in waking private dialogue (or, more correctly, monologue). But I am getting better, and my family is getting better. I had a magical day in Mattoon, Illinois, today. While waiting for some work to be done on our car, I went to the local mall and visited the new fabric store for the first time. What a pleasure it is to go into a store where everyone there is just brimming with possible ways of expressing themselves. It is a brand new store, so most of the people were there were also in it for the first time. I sat down at a table covered with pattern books and remarked to the person sitting across from me (a woman around my mother's age) how nice it was to be in such a place, and to have it in town. 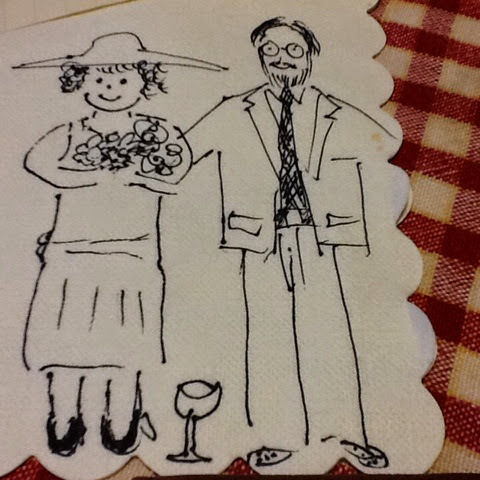 Then we began talking about anything and everything for about two hours (it turns out that her late husband was a local band director, and she had been to our last Summer Strings concert). She drove me to my arranged coffee rendezvous (which was brief, but lovely), and then I went to play for a class of fourth graders at a local elementary school. It was an exceptionally bright and engaged class of kids. I talked about the viola and played them some Bach. Then I opened the floor for questions, which turned immediately into requests: cowboy songs, songs from movies, themes from video games, Beatles tunes, and Christmas carols. They sang along, and some kids even got up and danced. One girl asked me if I knew anything from Sleeping Beauty, so I played her the Waltz. After I was finished she said, "That brings me to my happy place, and I didn't even know I had a happy place." I paid a little homage to my brother too. 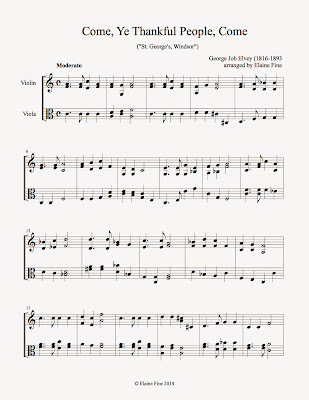 I read in a Facebook post from one of his colleagues that once during a demonstration of range on the instruments in a string quartet, Marshall went from the viola's open C string all the way into the upper reaches of the A string, far above where the fingerboard ends. I did that today. The kids loved it. One kid even gasped. My mother started to paint seriously around the time that she lost the ability to play the flute, and she stopped doing artwork when she lost the ability to see (I wrote a post about it in 2006). Rather than have it sit in her closets for nobody to see, my brother and I thought it best to bring our mother's paintings and drawings to Memphis (where he lived) so that they could remain safe within our family. The car my brother was driving on August 7th was carrying our mother's artwork. Michael and I brought the paintings and other family items along with Marshall's laptop computer back from Kentucky (where the accident happened) to Illinois, and I spent much of the terrible two weeks that followed looking at albums of family pictures, our mother's scrapbooks, and our mother's artwork. The Memphis Commercial Appeal newspaper ran a beautiful obituary for Marshall today. This a very sad time for our family and for Marshall's many friends, colleagues, and students. Memories of Marshall (which are ALWAYS interesting and colorful) are welcome in the comments. The modern way of computer-assisted grief is surreal. Because so many of my brother's friends communicate by way of Facebook, I found (and still find) myself in a state of having to deal with something that is deeply personal and deeply complicated in a public way. The constant stream of kind thoughts and carefully worded messages of condolence have helped me to feel very far from alone, so some of the attention has been most welcome. I have also been stung by the occasional unintentional violation of boundaries by people I do not know. Everyone's family has its specific ways of relating to one another, and when a family is in the "public eye" of the community of musicians, perhaps people assume the right to have sudden intimacies because of the intimacy of a shared musical bond with someone who has died. 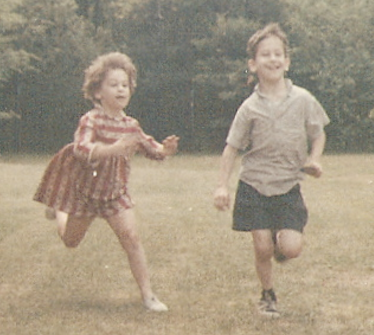 Growing up with Marshall Fine as my big brother was not always fun. He was indeed a musical savant as a child, and I was (of course) terribly jealous of his supernatural musical gifts (and they were supernatural). He truly did have the most accurate of musical ears and a great intellectual understanding of form and function in music. 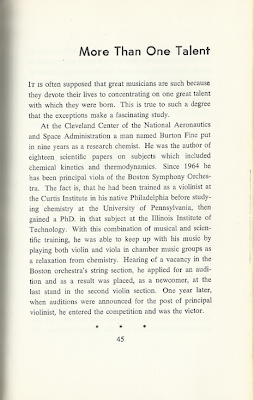 He had serious social difficulties as a child and as a young adult, and it pleases me a great deal to know that he had such a large community of people who really valued what he did as a composer, a violist, a violinist, and as a conductor. My relationship with Marshall was always riddled with sibling rivalry (Mom did like him best). We did not spend much time together as children, and when he was home (he went to a special-needs boarding school) life was difficult for everybody. After we grew up we would sometimes go years, and sometimes go decades without seeing one another. I can count on one hand the number of times we have seen one another since he left Boston for Atlanta in the late 70s or early 80s. We spent the past decade in (rare) phone and (less rare) e-mail contact, and during the past year we worked together helping our (blind and disabled) mother get out of her basement apartment and into a care facility. Our communications over these things had their difficulties, but the difficulties were challenges from the outside our family: people who acted in ways that gave our mother a great deal of grief and difficulty (don't get me started). I was always bothered by Marshall's elevated image of himself and a whole slew of other things not worth going into here, but in his last six months I also got to know him as a person with a good heart. Perhaps my greatest feeling of grief comes from the fact that I felt that our relationship as brother and sister had really started to have some meaning, and then it was suddenly cut off. For those people who never knew Marshall, he was indeed as brilliant a person as his friends present him to be. I joined Facebook last year because someone who played at a music festival with Marshall told me that he was on Facebook. I was indeed surprised when I "friended" him how many people loved and admired him. It does me proud as a sister to know that Marshall found his place in Memphis and that he had devoted friends. Last night I got out Marshall's laptop computer (which I removed from the wrecked car he had been driving), and I sorted through the compositions I found on it. I converted his Sibelius files into PDF files, made a page for him on the IMSLP, and have started uploading his music. My father has manuscript copies of Marshall's violin and viola music that haven't been engraved. We will arrange to have those manuscripts scanned. Marshall's music, like his personality, is intimidating. I spent much of my young childhood under the shadow of Marshall's enormous ego and intellectual brilliance, and the experience of going through his music puts me right back into "Marshall's sister" mode, something I don't remember feeling since I was a young teenager. I began my professional musical life doing different things from the things that Marshall did, and now I find myself doing the exact same things that he did, only with a very different musical personality and a different purpose. I am learning through first-hand experience that musical ego does reach far beyond the grave, and it is strangely healing to be able to keep that musical ego available for musicians to enjoy (or fear) even when Marshall is no longer among the living. I remember one Christmas Eve when I was a very young teenager (I was babysitting) quite vividly, because I turned on the television to find this lively Dutchman playing solo recorder music on WGBH, a station that would later become a PBS station. I got to meet Frans Bruggen backstage after he played a recital in New York in 1980, and hoped that I would get a chance, some day, to learn to play the recorder well and possibly study with him. I never made it to the Netherlands, but I did become a recorder player. We all owe so much to Frans Bruggen. He is responsible for a huge chunk of the mid-20th-Century revival of Baroque and Renaissance music, and inspired (mostly through his students) a lot of 20th and 21st repertoire for the instrument. It might be a while before I put up another music-related post because I am overwhelmed with communications with family and friends in the aftermath of an auto accident my brother Marshall had this past Thursday. He is in critical condition with injuries to his brain. Yesterday, after seeing him in the hospital, we drove to Horse Cave, Kentucky to remove the contents from the vehicle he was driving. Today I am trying to alleviate worry with as much hope as I can muster. People do recover from such accidents, and he is under excellent care. I have been posting news about Marshall on Facebook (which is where his closest friends communicate). If you look me up on Facebook you can read the posts I make there (I keep them public). 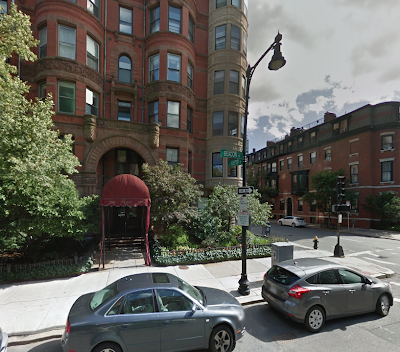 This is the building (295 Beacon Street in Boston) where Nicolas Slonimsky lived from the 1920s until 1964. Here's the 98-year-old Nicolas Slonimsky in front of his childhood home in St. Petersburg, Russia. I got the above pictures from a television show about him called "A Touch of Genius." Given the number of people who like to talk (and read) about food versus the number of people who like to talk about music, it does not surprise me that one of the most popular posts on this blog has to do with a condiment recipe I invented out of necessity. I decided to make "Easy Harissa" the other night, just to see if it was as good as I remembered. 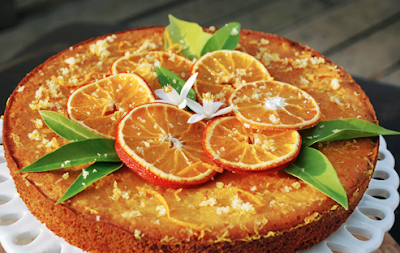 I found it a bit too salty, so I adjusted the recipe) a bit. The only problem with having Harissa around is that you will want to put it on EVERYTHING: eggs, salads, toast, vegetables, sandwiches, you name it. It can take over your life. You probably haven't heard of Antonio Maria Montanari (1676-1737) because none of his music has ever been published (it is, however, available to download from the IMSLP). Montanari was a teacher of Johann Georg Pisendel, who was a contemporary (and friend) of Johan Sebastian Bach. Montanari's D minor Sonata has three movements for violin and continuo, and this last utterly charming final movement is for violin alone. I hope you like it as much as I do. 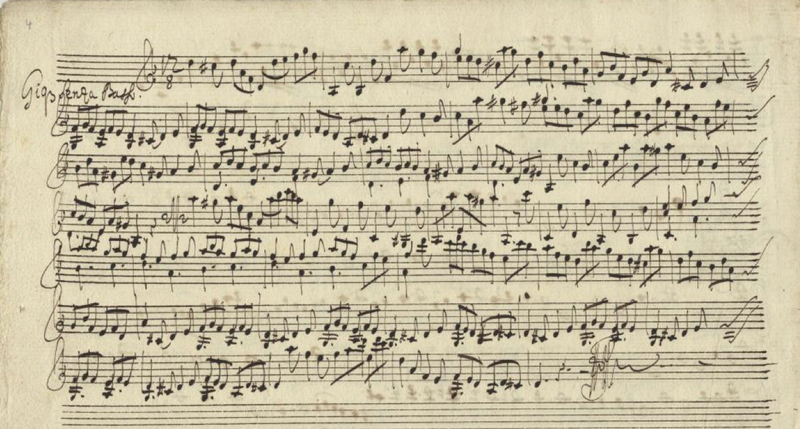 Of Johann Pisendel's 26 known pieces, only a few have been published, and only one (his Sonata in A minor for violin alone) has made it into a remote corner of the violin repertoire. There is so much music (and so much love) that happens here that it can't be properly put into any kind of a box (like a computer). Please ignore the moments when the camera microphone can't quite process what is going on, and enjoy hearing how beautifully this most beautiful piece of multiple cello music can be played. The cellists are Braden McConnell, Gabriel Martins, and Susan Moses; and the pianist is Kati Gleiser.